Where Can I Find Chips? There are lots of places to find computer chips. There are easy ways and ways that require more hunting and pecking. If you take the easy ways you will pay closer to “retail” prices for chips. If you are willing to put in more time searching for chips in the more obscure places, then you have a better chance of finding yourself a bargain. eBay is a great tool for collectors of all kinds. I have a store on eBay. Not surprisingly it is called AntiqueTech: Click here if you would like to see my store. To find chips on eBay you need search for them. There are three major ways to search for chips. The first is search for a specific chip for example you might want to try and find an Intel 4004 microprocessor in its ceramic package. This would be a very specific search, I would something like “Intel C4004” searching titles and descriptions: Click here to try it. This approach provides a limited number of search hits, but hopefully exactly what you are looking for. Not everyone labels their listing correctly, so the second method gives you more hits generally in the area you are looking for. So, say we what to look for all listing that contain Intel and 4004, just in the title. Your search might be Intel 4004: Click here to try it. This will drive up the number of search hits and you will need to search through them to find your chips. The last way is more like browsing than searching. You might look in the category of Vintage Computing (or ICs & Processors) and use the keyword Intel: Click here to try it. This will provide lots of hits. You may want to sort by price or end date. One of the first things to understand about chip collecting is that few people know anything about chip collecting. Electronic supply and surplus stores either online, or brick & mortar, are concerned with supplying electronic devices to engineers for engineering applications. Vintage chips are not viewed as priceless collectibles they are viewed as obsolete devices that are very slow movers in their inventories, inventory that is taking up space and collecting dust. If they don’t know about the collectible nature of their chips they generally happy to sell them for their gold content value, a few dollars. If they do know, then you will be paying hundreds of dollars. A few years ago, it was easy to walk into a surplus store an pick many highly collectible chips for less than a $100. There are not so many now. However, you should be careful what information you tell your seller. If you are a hobbyist who is restoring old computers and equipment, then you won’t raise any eyebrows. But, if you are collector, and you explain how you are searching for old valuable chips, well you may lose a source for reasonably priced chips. As you search online for electronic supply stores. You need to know that many are in fact brokers that will search for the chips with suppliers that they know. Unless you are planning to buy in large quantities, they will not be interested in helping you, or they will greatly overcharge you. Even when you find an electronics supply store that has the chips you want, they will not give you a price. They will want to know the quantity you are looking for and your target price. If you give too low a price, you won’t get much help. So, if you are desperate and are willing to pay the price, this can work for you. If you have a real electronic surplus store in your area, they are a blast to visit. 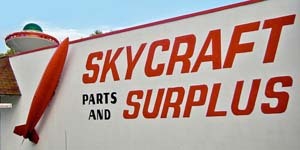 In Orlando, we have an awesome place called Skycraft (Skycraft Parts & Supply, Inc). For folks that are into electronics, it is a must see tourist stop. There are lots of shops and sites that can help pinball and video arcade game repair. Most deal in the specialized mechanical parts and full circuits boards needed to maintain these machines. A great list can be found at Home Pinball Repair. However, there are fewer number that actually carry the chips needed to repair arcade machine circuits boards. Here are a couple of examples: Arcade Chips, Arcade Components, and Ali Express. Hamfests have been around for a long time. Hamfests are social meetings for people interested in the amateur radio hobby. From a chip collecting standpoint, the interest is in the fleamarkets that are generally held associated with these events. Chips have been used since their early days in radio equipment and in the equipment used to support the amateur radio hobby. It is not uncommon to find someone who has some surplus of older chips that may be interested in selling or trading. To find your local Hamfest, or some of the largest, try the National Association for Amateur Radio. Very few computer festivals seem to be around. One that might be of interest is the Vintage Computer Festival. There are also some vintage computing societies that have gathering, the Atlanta Historical Computing Society is an example. Trading among collectors is one of the characteristics common to almost all collecting hobbies. The challenge is that almost always that trading must happen by mail. It is important to develop relationships before attempting large trades. References from other collectors is always a good thing. When proposing long distance trades it is important to document the trade with numerous photos and clear lists of chips. Don’t try to doctor photos. Experienced collectors understand that there is no such thing as a perfect chip, so make sure all the warts are disclosed, so a happy trading relationship can be established.